With March comes 5 weeks of giveaway madness! Find out what we have planned this month and get ready to win! What’s your favorite local pet-friendly location? We are building up a list of recommendations for pet-friendly places throughout the US and Canada for our Foursquare page and would love your input! To enter this week’s giveaway, tell us a tip about your favorite pet-friendly place. Please include the name of the place, city where it is located, and your personalized tip! Three entrants will randomly be chosen to receive a copy of Jim Dratfield’s dog photography book, Dogphoria! Home – Los Feliz, CA – Great atmosphere and delicious margaritas. Sit out on the patio and bring your dog! Sniff Dog Hotel – Portland, OR – Happy hour from 5-7pm $1 off draft beer and wine while your dog plays in the indoor park! Norm’s – Seattle, WA – Go out for a beer with your friends, and your dog! Norm’s is dog-friendly and has a great happy hour from 4pm to 7pm! Saint Patrick’s day is this week! To celebrate and to enter this week’s giveaway, share a picture of your pet wearing or sitting next to something green! As long as there is green in your picture, we’ll count it! (Only one entry per person will be counted). On Thursday, March 17, 2011 we’ll randomly select one winner to receive a $25 gift card. Honorable mentions will also be featured on our blog. 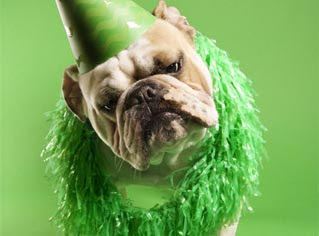 Does your pet have the ‘Luck of the Irish’? Tell us a lucky story involving your pet to enter this week’s giveaway! All entrants will be put into a random drawing and one lucky winner will receive a $25 gift card. Winner will be announced Friday, March 25, 2011. Has your pet ever gotten into mischief? Share a picture or a story with us about how your pet has been naughty to enter into this week’s giveaway! (Only one entry per person will be counted). On Thursday, March 31, 2011 we’ll randomly select one winner to receive a $25 gift card. We will also feature honorable mentions on our blog. Disclaimer: No purchase necessary. Entry method via e-mail. Giveaways are open to residents of the United States and Canada. Limit: 1 entry per user. Duplicate entries will not be counted. Trupanion employees are excluded from this drawing. All winners will be contacted via Facebook message or e-mail. Winners are selected randomly via Random.org. Facebook users be sure to have privacy settings allow us to send you a message. If selected winner has privacy settings that prevent us from contacting them, we reshuffle the drawing and select a different winner. Chances of winning are based on participation. By entering the contest you are agreeing that Trupanion can use all or a portion of your entry in any company materials, including but not limited to company website and blog.